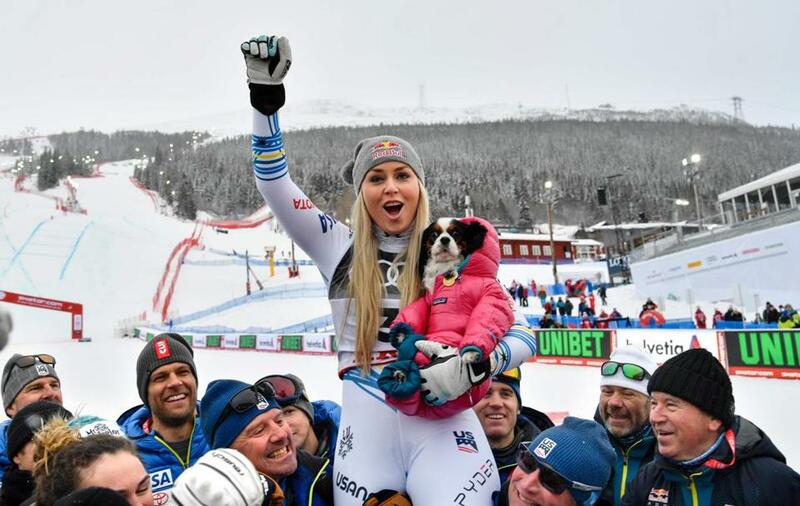 Lindsey Vonn celebrated with the US skiing team and her dog Lucy after winning the bronze medal in the women’s downhill at the World Championships. ARE, Sweden — Lindsey Vonn walked off with her career haul of medals in her right hand, the gold, silver, and bronze clinking together almost weighing her down. ‘‘I'm literally tapped out, I can’t cry anymore,’’ the 34-year-old Vonn said. ‘‘I want to cry but it’s dry . . . It’s not an easy thing to feel your bones hitting together and continue to push through it. Lindsey Vonn poses with her medals following a news conference at Ski World Championships in Are, Sweden. Vonn had been planning on retiring in December but she recently moved up her plans due to persistent pain in both of her surgically repaired knees. Then came the super-G crash, when she straddled a gate in midair, flew facefirst down the mountain, and slammed into the safety nets. Vonn became the first female skier to win medals at six world championships. It’s also her fifth downhill medal at a worlds, matching the record established by Annemarie Moser-Proell and Christel Cranz. ‘‘Thank You Lindsey: Forever A Star,’’ read one sign positioned by the side of the course. Four US flags were in the grandstand when Vonn came down and there were quite a few cheers when she started her run wearing a suit with blue-and-yellow trim — Sweden’s colors — to honor Stenmark. Vonn eclipsed her own record from two years ago for oldest woman to win a medal at a worlds. Now she can finally let her body heal and move onto the next phase of her life. ‘‘I'm looking forward to just chilling out a bit and recovering everything, including my mind,’’ Vonn said. ‘‘It’s been a lot to process.